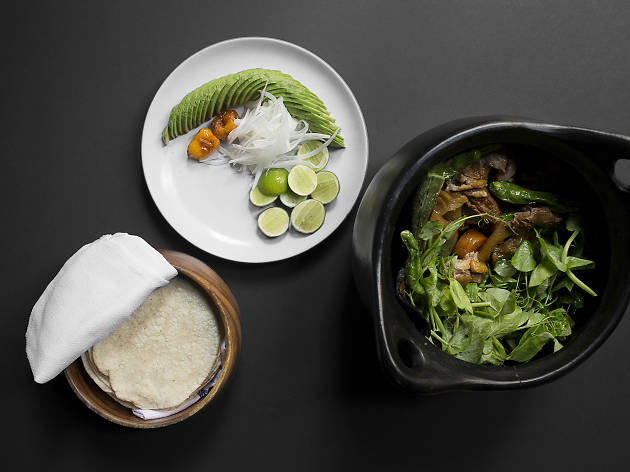 Enrique Olvera, the megawatt Mexico City talent behind Pujol (regularly ranked one of the 20 best restaurants in the world) made his stateside debut with Cosme, a bare-concrete Flatiron dining room slinging elegant, high-gear small plates. 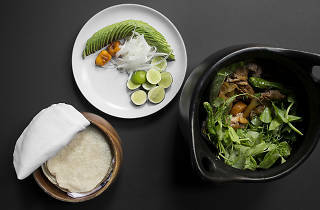 Pristine, pricey and as market-fresh as anything coming out of Thomas Keller’s kitchen, Olvera’s menu is a masterpiece. Tacos make a solitary appearance, in an atypically generous portion of duck carnitas, cooked to the sinful midpoint of unctuous fat and seared flesh. 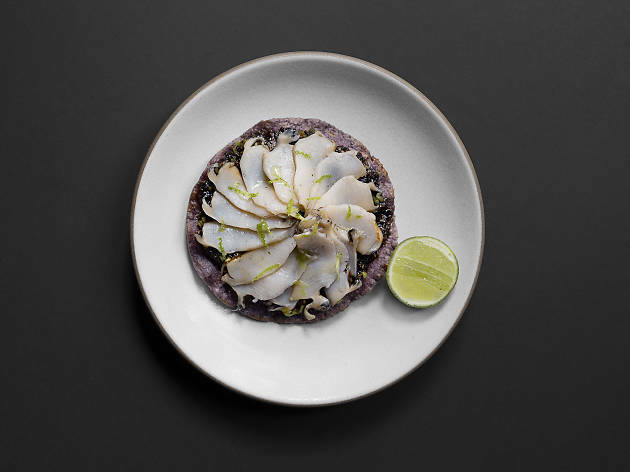 But his single-corn tortillas pop up frequently, from a complimentary starter of crackly blue-corn tortillas with chile-kicked pumpkin-seed butter to dense, crispy tostadas dabbed with bone-marrow salsa and creamy tongues of uni. 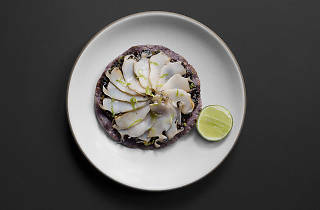 Those soft corn rounds accompany the cobia al pastor, a beautifully toned-down take on the original, with slips of delicate white fish whispered with pasilla, guajillo and tart pineapple sauce. And they’re there to cradle supple, roasted hunks of lobster pipil, nestled in a heady pool of black-bean–chorizo puree. But it’s that face-melting, savory-sweet, Instagrammed-to-death husk meringue, with its fine, ash-dusted hull giving way to a velvety, supercharged corn mousse, that cements Olvera’s status as not only one of the country’s premier haute-Mex ambassadors but also the corn whisperer of New York dining. And what damn fine dining it is. Disappointing would sum it, unexciting menu with choice of dull breakfast dishes presented as main courses. Zero culinary mastery, tiny tasteless overpriced dishes with many that involve no or minimal cooking. We were hugely disappointed, paid $100 for two and left hungry. 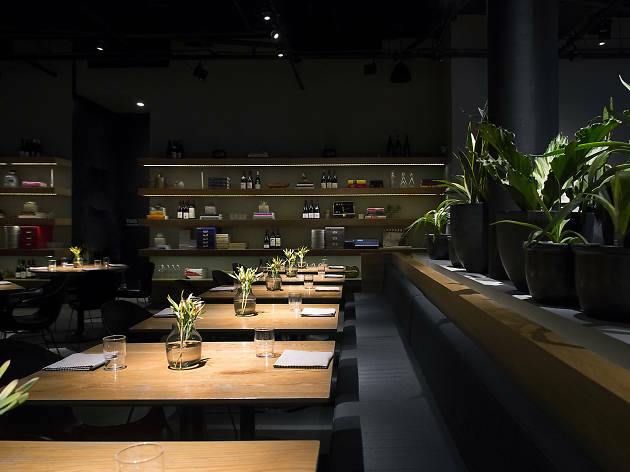 I was looking forward to trying Cosme for a long time and the food and service were very good. The corn meringue dessert and duck tacos were amazing and are worth coming for. However, it's very pricey and I thought the drinks were good, but definitely not worth $17-18 a piece. I also wasn't a fan of the fact that I got there at 5:30 and they were planning on sitting my boyfriend and I in a random corner. I have to say - I had the same experience as many other reviewers. I was really looking forward to the meal after all the hype (this was in early 2015). The drinks were great, the food was good, the vibe was hot-spotesque... but it wasn't magical. It wasn't special. It was just good. It's certainly overpriced and overhyped, but not a total let-down. 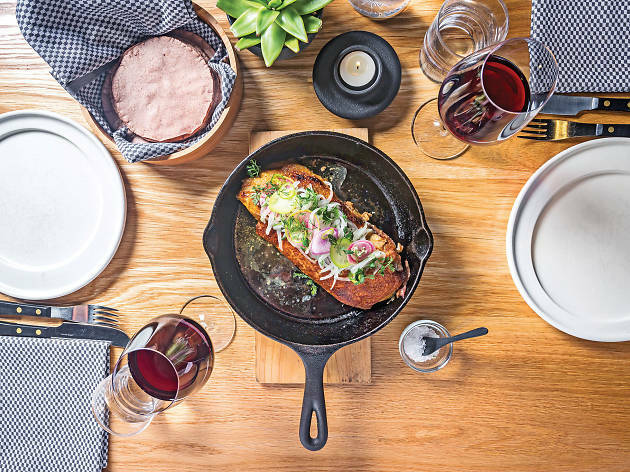 Just know what you're getting into before making your (hard to get) reservation. I agree with both of the reviews below! 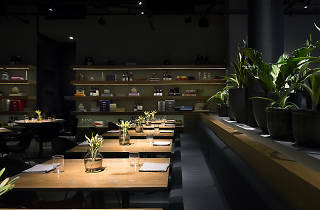 We waited months to go to Cosme and were so excited given the reviews, however, overall were disappointed with the meal. The food was dry and lacked the pzazz you expect from a place that has received so much attention. We ordered the duck carnitas. The only thing that saved this place from a one star is the Husk Meringue, which is one of their desserts and pretty delicious. If you do decide to go to the restaurant, reservations can be impossible so I would suggest doing what we did which was showing up around 9:30 pm on a weeknight. We waited about 45 minutes, but enjoyed a cocktail at the bar. I have never eaten in a restaurant that relies so much on hype and so little on good food. Pretentious; without even the slightest bit of quality to hide behind. This restaurant sums up everything that is wrong with contempory, social-media-driven, review-based dining. Avoid at all costs! Complete hype, the food is not consistently good and the portions are small, price is high for what you get. They don't give you enough tortillas then charge you extra for more. 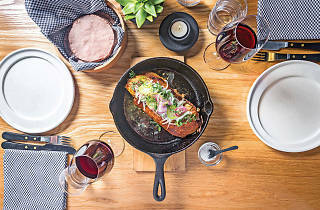 Some of the dishes are bland and bear almost no resemblance to Mexican cuisine while other dishes have overly aggressive unbalanced flavors. With reviewers falling over themselves to lavish praise on Cosme, you'd think they were paid, either that or they were blinded by Enrique Olvera's pedigree. In either case, price aside, the food is merely ok-good and not great. Considering you will spend $70-100 per person on food alone to feel full, there's no way this restaurant is a two $. 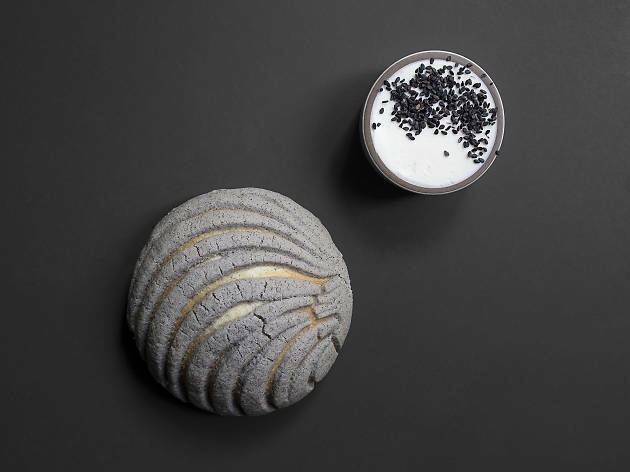 Delicioso, mexicano con mucha clase y sabor!